Featuring extra strength additives to kill more pathogens than professional grade wipes, these WipesPlus disinfecting wipes quickly destroy or deactivate various bacteria, fungi, and viruses, including MRSA, E. Coli, Staph, Salmonella, Tuberculosis, HIV, Polio, Herpes, and Influenza. They have a fresh lemon scent and convenient alcohol free formula that won't dry out hands during use. Plus, with an ample 6" x 6 3/4" surface and thick construction, each wipe is sure to last throughout the task. Great value for the money, larger size containers so you don’t run out as fast. I have them in every room, they work so well for dusting, cleaning and disinfecting all surfaces. It's a great product, a really good solution for cleaning kitchen surface without hassle. The scent is really nice and its look like it's doing the job well! Love them they are nice and thick, and cleans up well. Not over pouring smell . Perfect for our restaurant kitchen and other clean up in the shop. We like this WipesPlus Lemon Scent Alcohol Free Disinfecting Wipes - 240/Canister, its perfect to disinfecting surfaces, its perfect for restaurants, coffee shops, hotels etc. Honestly, I bought these disinfecting wipes because I thought it was a good value, but they were small and not very "absorbent". I found myself using two to get the job done....sorry. The product is exactly as described; overall very pleased with my purchase. For the price, these wipes are a complete no brainier for simple cleaning jobs around any restaurant or corporate environment. We purchased the lemon scented disinfecting wipes because our restaurant has a lemon theme. The scent is not overpowering but is slightly noticeable. We purchase these canisters in bulk. We use these to wipe down the tables in our cafe. Sure, they are pricey but protecting the public health is our number one priority. We use these wipes to clean all surfaces in our business. The scent is refreshing and gives a nice feeling. They do not break easily. Great wipes. As good as name brand wipes. Which is great. So many off brands are junk and tear apart when you pull on them but these are nice and strong! So when i pull them from the tub they stay together. The tub is also very nice. Its dispensing section closes tightly so keep the towelettes from drying out over time, and also has a nice grip when pulling the towels out, so you can easily pull one out and separate it from the roll. they get messes cleaned up easily. These are pretty good disinfecting wipes for work or home. They work on any non porous surface we've tried and are EPA approved. They are a little small but you get a large amount for the price. These lemon scented disinfecting wipes are so handy and work just as well as other brands. I love the smell they leave behind. Great price! 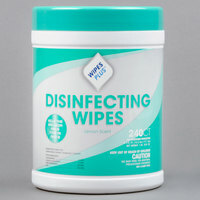 Love these WipesPlus Lemon Scent Alcohol Free Disinfecting Wipes - 240/Canister. Smell great, and perfect size. I highly recommend to anyone that is in the market for wipes. Not the best wipes. They are much smaller than regular wipes so for most jobs you need to use two. They also allways ripped below the lid when I pulled one out. So I was constituency taking off the lid an feeding it again. These are just alright. The wipes were pretty dry so it was hard to wipe down. It's also super hard to close and once you pull the wipes you can't put it back in. Don't plan on getting them in the future. We put a canister of these wipes in the bath to easily clean faucets, sinks, tiles, mirrors, etc of toothpaste streaks and soap scum. These are amazing. These wipesplus lemon scent alcohol free disinfecting wipes work great. The wipes are thin and moist. They rip apart easily. But they don't pull through lid easily. The two hundred and forty count canister of Wipesplus Lemon Scent Alcohol Free Disinfecting Wipes is a must for every kitchen, restaurant and household. They are great for cleaning countertops, walk in freezers and even dinner tables. The canister is easy to open but protects the contents from drying out. I would highly recommend. WipesPlus Lemon Scent Alcohol Free Disinfecting Wipes - 240/Canister clean good and everything but 1. they are lower quality than I expected and very thin and none abrasive, so I can't really even clean countertops with them, also have issues getting them out of the canister since the "mouth" on the top isn't soft flexible rubber, it's just a hard plastic, wish they would have designed it better. but they do smell good without giving me headaches and do clean if I use 2-3 and wad them up to try to scrub. These wipes are absolutley amazing. They smell great, and clean great. I love the resealable refill pouch. It makes it easy to take them on the go. These wipes are great to have on hand. We use them to clean tables in between uses. Comparable to the brand names and available for a much lower price here. Great product. OH MY GOSH! best thing ever! we have these laying out on the front counter and label it "table wipes" customer just clean up after themselves and its perfect during rush hour when you can't get to the tables fast enough. deff better than the leading brands. Disinfecting wipes are something I always have on hand for cleaning and sanitizing. The wipes plus lemon sanitizing wipes are a great price. highly recommended! Compare these to the Clorox version that is offered also. However with these, you get almost 3x the amount of wipes. If you can sacrifice the name brand, these wipes work great! When I saw how many wipes you get in a container and for the price, I was pretty excited. This makes cleaning up messy jobs easy and I just throw them away so I don’t have to worry about cross-contamination. I don’t have to contaminate sponges and be paranoid if I cleaned them properly. These are simply cost effective too and well worth it just to save time and effort. They don’t have a chemical smell at all – just a fresh scent. I love this disinfecting wipes! They are perfect for sanitizing! And in this not that big canister there is a lot! Great value and great quality! A lot of wipes in a large cylinder container. Disinfectant as well as a general cleaner. Good price and you should always have these on hand. These wipes work great for cleaning off tables when we are serving a large amount of people. They are convenient and last for a long time. The wipes are awesome for disinfecting and cleaning the kitchen countertop. I use them every single day with that purpose. The canister is priced at a great value! This is a large canister of disinfecting wipes that can clean surfaces and in dorm rooms and to keep meat used tops from having bacteria. I just received these wipes and so far have used them for cleaning my kitchen counters after cooking, cleaning areas of my bathroom, and also for dusting surfaces in my bedroom. They really are perfect for any kind of job where you need to wipe away a mess. Best of all, the mess stays on the wipe since they're moist. While these seem to work fairly well, I have been unimpressed in comparing them to standard store bought disinfecting wipes (like Clorax). First off the material these are made from is different, and they seem not to hold as much liquid as the alternatives. And so overall they don't clean as well. (On the plus side, this material does seem to hold together a bit better.) Additionally, the wipes are sized quite a bit smaller than the standard kinds. Not by itself a big deal, but it meant that when I was comparing prices, I thought I was getting quite a bit more than I did get. Literally, I use these wipes for EVERYTHING! They are BETTER than the clorox ones!!!!! These wipes make our life much easier! They much wetter than the leading brand ! Making them last longer and less costly! We will keep buying these for sure! I use these wipes at home and keep a canister in both the kitchen and bathroom. They are a little bit smaller size than most other wipes which I think makes them more economical. I find that they are very effective for all kinds of spills and stains on counters, stove top and floors, and with a canister this size, they seem to last forever. Quickly disinfect surfaces and clean up spills with confidence. The scent isn't perfumy or overpowering, it's just right. Large container is perfect for keeping a lot of wipes quickly accessible. My only dislike is how the wipes separate from each other. I might have gotten a bad batch, but they're a pain to tear apart. Every other wipe has a little too much connecting to the next wipe. I've had to tear them and they tear a little unevenly. Love, love, love These wonderful wipes. Very handy to have everywhere in the house not only the kitchen and bathrooms but in the garage, playroom, even in the chicken coops. They last and last and have a good smell, just very soft to your senses. Really am enjoying these wipes. I like to know that my surfaces are disinfected before I prepare food. However in the past I have noticed that there is not necessarily a lot of liquid on each wipe. With this brand, one wipe cleans a large surface and has a lot of disinfectant liquid to really sanitize a large space. I am really pleased with the product and the price. I will be using this as a staple in my kitchen. Thanks.